On Friday morning, BFF Sarah and I will be heading to Philadelphia to attend the two-day Women of Faith weekend (WoF). Thanks to BookSneeze, I received two free passes in exchange for telling y’all about my experience. Sounds good to me! Ah, the perks of being a blogger. I’ve never been to a Women of Faith weekend, so I don’t really know what to expect. According to the WoF website, outside food and drinks will be confiscated—does that mean I can’t shove a pack of Mentos into my purse? Will I be forced to pay $4 for a small soda? I know that Jesus is the living water, but will He be handing out Deer Park at the event? Keeping us dehydrated could cut down on those infamously long lines at the women’s restroom I suppose. Anyway, the theme of the weekend is “Imagine,” and I will, “be refreshed, encouraged and inspired. Because the God who loves you can do far more than you can ever Imagine.” (Refreshed = free water, I’m sure of it.) Lately, I’ve been feeling parched, discouraged, and vacant. I don’t feel like I can make it through another minute. My strength is failing me. Not only do I need courage, but I need to be encouraged. I have so many thoughts running through my head. I want to do this and that, but I get so tired—I’m too tired to start, too depressed to even try. I ache for inspiration (and motivation). And I think, I can’t go to Women of Faith this weekend. I’m too weak, too depressed, too me. My anxiety is kicking up at the thought of being closed into a stadium with thousands of women. The thought of being touched or hugged by a stranger gives me knots in my stomach. O, God, please don’t make me go. I won’t let my fear control me. I will bask in refreshment, encouragement, and inspiration. I will let it fill me up and surround me like a warm bubble bath, and seep into my dry soul like aloe vera. Have you been to a Women of Faith weekend? What was it like? Think my Mentos are contraband? Are you going to Philly this weekend for WoF or another stop on the Imagine tour? 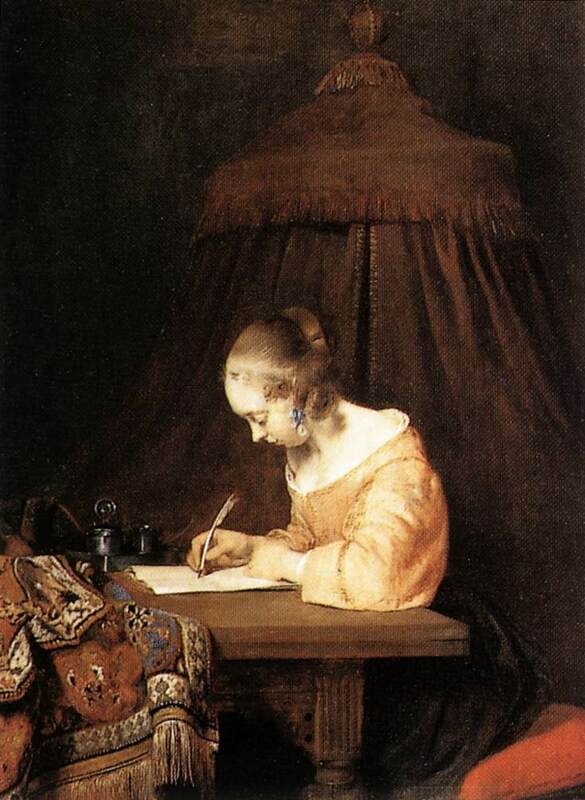 If I lived 200 years ago, I could be the woman writing with the quill in this painting. I was trying to think of some whimsical, light-hearted topic to share with the world, or maybe something insightful or amusing. Perhaps I’d go for a topic about God or the Bible to encourage everyone out there. Unfortunately, I’ve got nothing…not really. But I thought, well, maybe I should blog anyway. Although the basis of writing a blog post is to actually say something, what if I say nothing of substance? While some may argue that none of my blog posts have substance, I can assure those of you in that camp that this post will lack more substance and focus than usual. See, I like to have my thoughts well-ordered and organized before I present a topic to the world. Using keen words and stunning adjectives, I want to wow the world with my command of the English language or just my writing ability. It’s sad that sometimes the only thing I think I can do correctly is write, and even then, I still kick myself for the typos. I’m not looking for compliments or assurances about my writing. I’m just sharing an irrational thought that swims through my brain. At times, it really scares me because if I’m not a writer, then what am I? If I can’t hide behind my skill, then I would have to be something else besides…a writer. I wish I could say that I would be sustained by my identity in Christ; unfortunately, I can’t promise that. As much as I would like it to be true, I think my main struggle in life can be tied back to this simple truth–I struggle to know who I am in Christ and how God views me. It seems so much more important what single Christian guys or random strangers think about me than the King of the Universe…and I don’t know why that is. Rationally, I know God’s opinion is the one that matters, yet even as I type on this blog I wonder what some of you out there think of me. Not what I write, what you think of ME. This is an area of my life I am praying about and asking God to change in me. Of course, He can’t just zap me with self-confidence (enough assurance to be confident, but not too much to be cocky. A shot of appropriately humble will do), but He actually takes me through experiences in which I come face-to-face with situations that stretch, mold, and bend me. More than ever, I see my life as a construction zone. I want to tell people I meet now to come back in six months because you’re just seeing the framework of who I could be…I’ll be much more fantastic and interesting then…and then you’ll want to stay. Really, I am changing, but at the same time I’m still afraid that people will leave because I’m not enough. If I’m forthright about the process, does that mean I get a extension on your opinion of me? I realize how stupid that sounds, but stupidity loves company. Almost every person has struggled with issues of identity, purpose, and spirituality. I guess I want to be real about my current battles because it helps keep things in perspective for me, may help someone else, and because I’m a writer and that’s what we writers do. We write about stuff that (hopefully) matters.